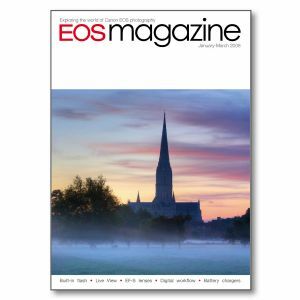 Add this issue to your photographic library for techniques on built-in flash, Live View, Canon's EF-S range, looking after your Canon batteries for optimal performance and workflows. Professional showcase David Noton makes the art of landscape photography look straight forward, but the simple beauty of his images belies the hard work and carefully considered technique behind them. Brilliant light The versatility of your camera’s built-in flash may surprise you. Philip Raby helps you to get the best out of this handy light source. How was it shot? Have you ever been struck by an image and wondered how it was taken? Photographer Zac Macaulay reveals what was involved in this underwater shoot. Live View Live View helps you see what the camera sees before you take the picture. Gary L Friedman shows you how to make best use of this impressive feature, found in Canon’s latest digital cameras. EF-S lenses Four years after they first went on sale, there is still confusion about EF-S lenses. Why were they introduced, and which cameras do they fit? All the answers are here. On stage With tricky lighting and restricted access, photographing concerts or theatrical productions is particularly challenging. Edward J. Baumeister Jr shares his professional experience. Power points Your camera needs power to drive its many highly advanced functions. David Newton tells you how best to look after your camera’s batteries and so extend their useful life. Workflows Taking photographs is only part of the photographic process. Viewing the images, printing and storing them are just a few of the additional steps. We look at some of the work involved.